Photo of the actual 04 Harley-Davidson VRSCB V-Rod for sale. Image credit: . Insurance: Get estimated US insurance cost with a quote from Allstate Motorcycle Insurance. Fill in the form below to contact the motorcycle seller by e-mail. You are free to make any offer. Many bikes are sold below the wanted price. Bikez.biz is not responsible for the correctness of the information in the advertisement. As a buyer, it is your responsiblity to check the above data given by the seller. Do not send money to strangers and expect them to ship a bike back to you. Bikez.biz does not sell, display, or misuse your reply e-mail address. 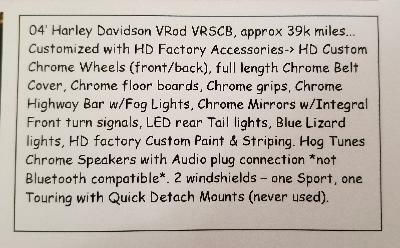 Check out the technical specs for the 04 Harley-Davidson VRSCB V-Rod at Bikez.com. Here you will also find an owners' discussion group and, for most newer motorbikes, other bikers' rating of the machine. Use it to take advantage of other motorcyclists' opinion on performance, reliability, design, fun factor, repair cost, accident risk, and more. Ask any question about technical details, accessories, maintenance, offers on parts, tuning, styling, clubs, events, tests, dealers, finance, insurance, fair second-hand prices, etc. You can even sell or buy used parts. And place a free classified to sell your old MC. We have several thousand registered buyers of used bikes waiting for your ad. Ads can be removed or edited whenever you want.